Reflection and community partnership are essential elements in transformative service-learning. For more information about facilitating reflection and building community partnerships for effective service-learning please see our Service-Learning Resources and Service-Learning Toolkit. What are best practices in facilitating reflection on the service-learning experience? Coaching and providing emotional and intellectual support to students. Service-learning reflection can be structured as in-class discussion, written assignments, or creative projects. Verbal reflection through in-class discussions or debates help students gain additional insight from the observations and ideas shared by the class. Guide the discussion with questions following the What? So What? Now What? model to ensure that students move from sharing feelings and experiences to analyzing and applying them (Eyler & Giles, 1999). In the classroom, professors and instructors can utilize Borton’s (1970) What? So What? Now What? sequence to guide reflection discussion as well as written assignments. The reflection prompts challenge students to engage with their service experience, connect to classroom concepts, and consider how to take further action. What? Students describe their service experience in the community. So What? Students analyze and interpret the experience by connecting the service experience to themes and concepts learned in class. Now What? Students consider implications and applications, and are invited to explain how new insights and perspectives should affect future practice. Written reflection can take the form of journals, essays, or blackboard posts. Written reflection assignments invite students to organize their thoughts and clearly explain the connections and conclusions they have made. The use of multiple forms of written reflection can maximize benefit to students. Hatcher, Bringle, & Muthiah (2004) found that “when students participated in both a form of ongoing reflection (i.e., journaling) and summative reflection (e.g., final paper, report, presentation), they demonstrated higher gains in personal social values and civic attitudes than students who participated in only one type of reflection activity” (p. 39). Service-learning faculty and instructors can also introduce relevant texts, films, or case studies and ask students to compare them with their experience. Morton (2007) suggests combining different sources to ask “how does our interpretation compare to the interpretations of others concerned with similar questions?” Can we begin to imagine ourselves as part of the dialogue in this larger community? What can we learn from this comparison? And, finally, we might develop some particular objective data, data that will hopefully illuminate both the literature and the experience” (p. 15). What are best practices in developing community partnerships? Cultivating high quality community partnership entails attention to logistical steps and underlying theoretical concepts. The following procedural guidelines for developing community partnerships are adapted from the practices identified by Bringle and Hatcher (2002), who highlight stages of partnership establishment and maintenance including initiation, monitoring, affirmation, and assessment. 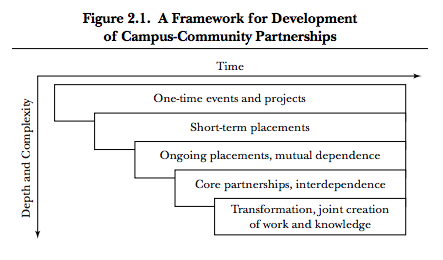 When initiating a community partnership, both campus and community representatives should collaboratively define program priorities, learning objectives, values, and goals. Faculty and community partners can discuss procedures such as faculty and agency policies, contracts, liability issues, expectations of students, and agreed upon systems for training and orientations for service-learners (Sandy & Holland, 2006). Additionally, partnership initiation is an important time to disclose the resources, personnel, facilities, and time each partner is able or willing to contribute. The McLean Institute has developed a Service-Learning Agreement that can facilitate this process. As an ongoing practice, campus and community stakeholders can monitor the partnership by maintaining open lines of communication and checking in regularly over the course of the collaboration (Sandy & Holland, 2006). Monitoring can facilitate an appraisal of accomplishments, which provides an opportunity to affirm the partnership. Campus and community partners can consider ways to acknowledge the value of the partnership and celebrate how it impacted those involved. Finally, community-university partnerships can engage in assessment to determine if their mutually created goals and objectives were met. The McLean Institute has created a Student Evaluation and Community Partner Evaluation that can assist in the evaluation process. Conceptual guidelines for developing community partnerships offer a way of understanding the nature and outcomes of different partnerships and what factors define them. Service-learning relationships can range from transactional relationships that are utilitarian, exchange-based interactions where no deep change or lasting relationship is expected, or transformational relationships that “result in both persons growing and changing” (Bringle, Clayton & Price, 2009, p. 7). Significant levels of closeness, equity, and integrity advance a relationship to a partnership and these characteristics determine the status of a partnership. 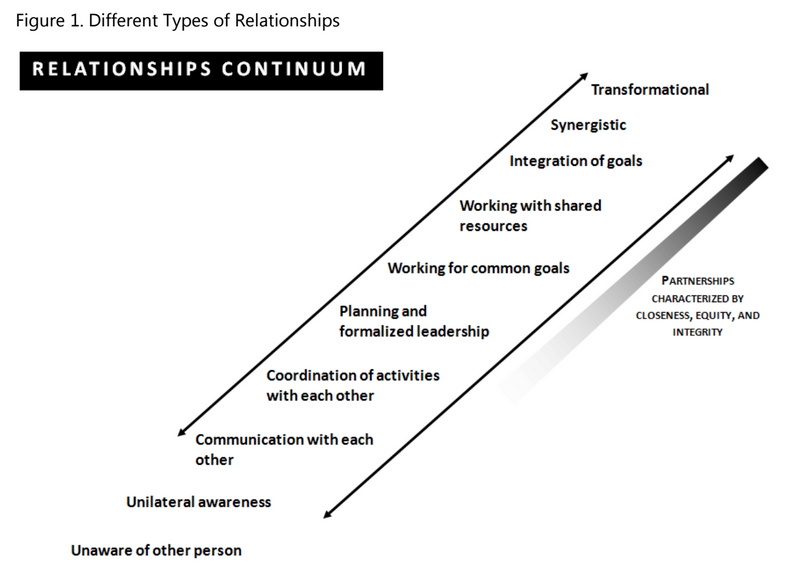 The relationship continuum (Bringle, Clayton & Price, 2009) ranges from unaware to transformational, and the position of a relationship on the continuum depends on its closeness, which can be measured by evaluating: (a) frequency of interaction, (b) diversity of activities that are the basis of the interactions, and (c) strength of influence on the other person’s behavior, decisions, plans, and goals. Equity exists when each partner perceives that their outcomes are proportionate to their inputs and is possible even if the outcomes for one partner are seen as greater. Relationships with integrity are characterized by internally coherent values, matching of means and ends, and offer a way of defining problems and solutions (Bringle, Clayton & Price, 2009). While many service-learning partnerships begin as transactional relationships, “a pattern of short-term partnerships can provide the foundation for more extensive collaboration in the future” (Bringle & Hatcher, 2002). If depth and complexity of interactions increases as time goes on, transactional relationships grow into a transformational partnership. As the graph suggests, transformational partnership are built on and can still include less complex interactions (Enos & Morton, 2003). For more information about facilitating reflection and building community partnerships for effective service-learning please see our Service-Learning Resources and Service-Learning Toolkit.